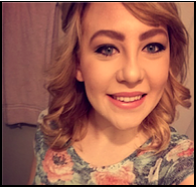 Rebekah is currently a sophomore at Arizona State University studying Elementary Education. We are so glad to have had her on her team this year! Rebekah secured both of our most recent partnerships: Amazon Smile and Fry’s! She has also completed the entire inventory and order for all 14 schools next semester! We want to thank her for her hard work and dedication as well as wish her well as she will be finishing up her internship next week! Thank you for #beingbetter Rebekah! !